Memory Distilled is a Python script that extracts the most used words from a text and places them into a shaped wordcloud. This project starts in the bosom of the artistic residence of Trasformatorio 2017, to which I was honored to participate. The main idea was to transform the energies and the resources that we found abundant in Scaletta Zanclea into something to give back. For days I observed the people, the feelings, the landscapes, the thoughts: an explosion of beauty that was awaking in me lots of forgotten stimuli. Only in the last days, I’ve suddenly realized that the biggest transformation had occurred inside me thanks to the new experiences I was put into: as a project I wanted to distillate my thoughts as the deepest expression of my inner processes. I keep a diary in which I record my days and thoughts, that was my starting point. The starting point was given by the things I wrote down in those days. I’ve applied to it algorithms of Natural Language Processing to split the text, to bring back the words to their original lemma (basic form) and to compute the frequencies of usage of every single word. At this stage, I can deduce which are the most dominant concepts reported in my diary. Through algorithms of Sentiment Analysis, I can assign a different color to the words that belong to the neutral, positive or negative semantic field. When it’s all set I print them onto the shape of the beautiful castle that has hosted us for 10 days. A conceptual storytelling based on a local legend which is lost in time, using photography and slow motion animation, narratives and digital interaction. The legend of Macalda of Scaletta presents the ordinary life of a living ghost in a contemporary reality moving freely around the village. After having different conversations and interviews with local people from Scaletta Superiore and Inferiore, we collected memories and impressions to inspire our project and recreate the legend as a contemporary one (future of storytelling). 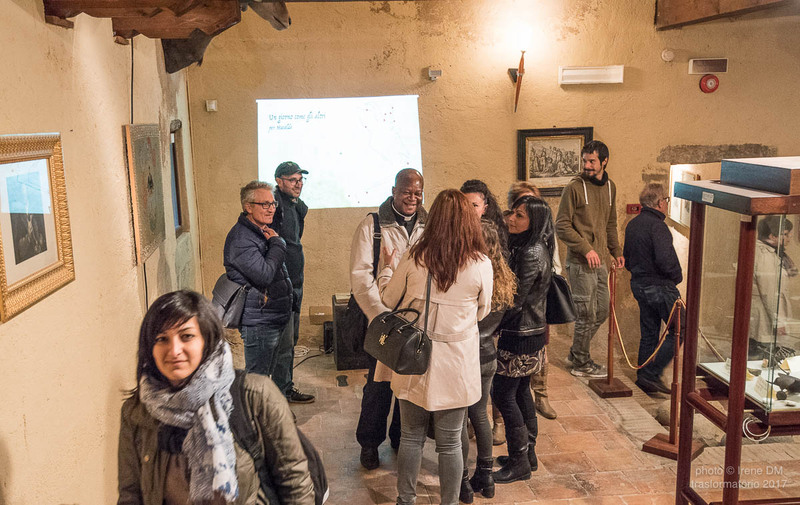 The interactive storytelling allows the user to visit different locations and navigate on a map of Scaletta which connects the old and new village. In every spot, there is a picture or a short animation appearing together with a sound file (narrator voice or sound). All participants in this project (making off, the whole process, interaction): Irene, Martina, Jakub, Nino, Giulio, Rosaria. I don´t have a video version that can be used online. If Nino or Giulio can create a video with some linear narrative containing the audios, it can be used to present this project on the internet (Youtube). A visual photo documentation of Scaletta Zanclea during the residency period. The memories collected are directly connected with the sensorial perception of the environment and mixed with own impressions. While editing the images, a text came out as a narrative for the visuals collected. (Find it below and as an attached doc to this email). It´s 17:10 to my left and 14:50 to my right. Where am I? One turn, two, three and four, what´s the time? Life moves backward and forwards in this strange paradise. of electric wires and ferocious plants. trapping through the leftovers of an empty house. solitude caress the pale with gradients of a green palette. an army of Mother Earth. While something perishes, something else is born. wilderness raises embracing it all. this village goes up and down with a beautiful nonsense. smiling and wondering about all these artifacts and waste. there is something peculiar in the streets and their smell. some doors remain close when others are not found. The people of this village are peculiar as well. They are scalettians, they function as the stairs. Life goes always up and down, down and up, who cares. While the dead ones meet up, modern life flows down the stairs. Nature likes to play here too with disasters and big flows. They take away what men have built and leave a mess around. When nature wants to manifest it is an horror show. play triumphant trumpets on their march towards the Sea and Beyond. Memory seems to be forgotten in this tiny town. if they were once alive or dead or even if they existed. hang together and remain as local villagers. how to answer to this question without feeling lost. I love the fact that this place is a mixture of all times. and others like a storm. You can see many pictures taken by Irene all over the documentation of Trasformatorio 2017. She has a deep sensibility that she showed in a series of portraits of nature as well as the people she met. Half of the secret dramaturgy of the operation rested on her strong shoulders and I would not have made it without her. This is not an evaluation talk, is a thank you. Alluvione was made out of memories from tragedy, hope and nostalgia. A great flood in 2009 made an impression in the people from Scaletta and its landscape. One afternoon spent with any of them will allow you to feel the fear, shock, and respect people have towards nature, which always reminds us it cannot be controlled. Nostalgia because the cactus brought back to me memories from my country with a beautiful reminder of hope. The cactus has a slow and beautiful process of decadence, with the right timing, one can find traces of their inner structures dried out. Many of these leaves were specifically selected and dyed with the natural pigment of the fruit from the same plant, tuna. Later on, they were joined one after another to create a line which symbolises tears. Alluvione was placed in a specific site of the castle tormented by air, as a reminder of the flood and the unstoppable trace and force of nature. Azucena work proceeded from familiarity and observation. Her sensibility transformed her findings into textiles, into the coral reef, into food, and memories. Left flying on the castle tower until has been cut out, by a knife, in the morning sun. 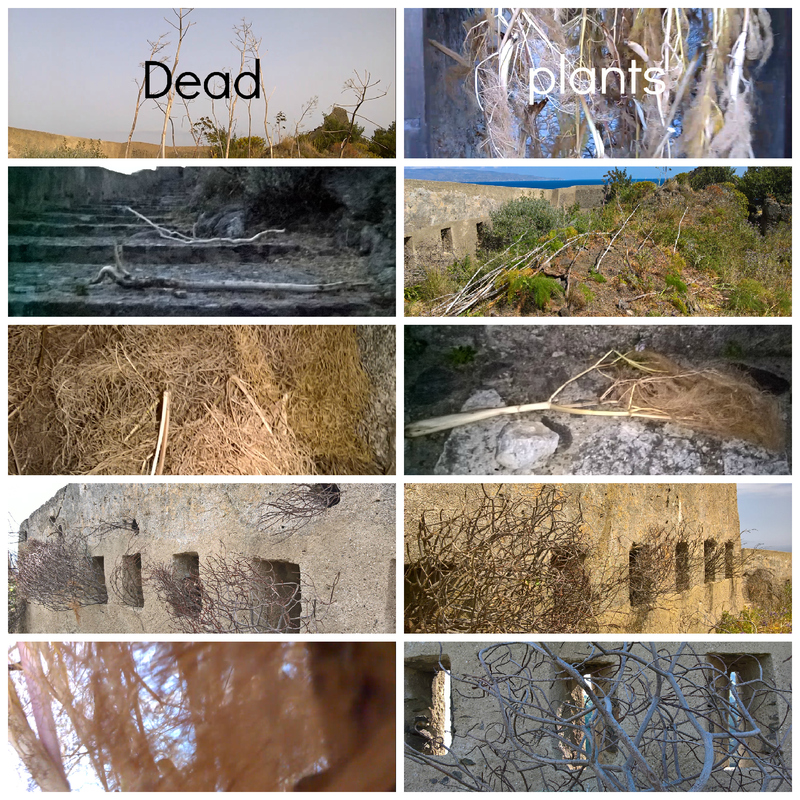 Arranging dead plants found in Scaletta Zanclea had to me at times more immediate function and overall an underlying driving force. Curtain at the entrance of the castle made of dry giant fennel branches meant to mark the passage to a place where one can allow oneself more and is more open for reception, to take one defenses somewhat down. For a moment one is being brushed over by the plants, not knowing or seeing what is behind them, what is the meaning of it, and where does it lead to. Immersed and then free again to experience works that are awaiting visitors. I found beauty, inquietude and gloom in branches placed on stairs to the castle. 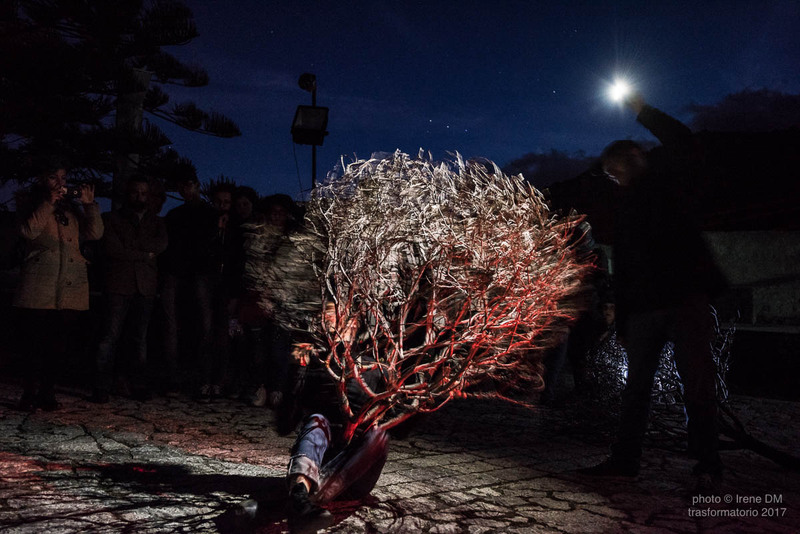 Similarly with dry trees that became part of Martina Caronna’s and Irina Baldini’s performance. The driving force behind collecting the dead plants and making use of them is willingness to express sadness. Sadness of loosing home, sadness of loosing close people, sadness of some things that happened in my life, in life of my parents, in life of my grandparents, in all of our lives. And to accept this sadness. Thank you to all of you who got engaged with the dead plants, helped with them and changed them. Your words, gestures, deeds and sheer presence made it all happen. Jakob, Kuba for us, in various sounds and accents. Wandering up and down for the path to the castle tower. Day by day. Taking up textures, fighting thorns, stones, sweat and the wind. From the sea to the higher point of the tower. Efficient collector, smiling. We engaged in a staged fight where I killed him in a gruesome way. Poor Koba, he died laughing and was reborn a second later with a big smile. His rebirth was a happy one, as, later on, he was the only one to swim the Scaletta sea, the strait of Messina water of the utmost blue, famous to be icy also in the summer. And so we took the tree on our shoulders. 8 of them. and all we were silent, one foot after the other, to the dark village, in the grasses. And on the pavement of the castle, looking up, we saw the dark spectral presence of the tower and our hart weakened. Strong wind. Sky covered. Someone started lighting the trees. And danced. And we sang. And the shadow of the dead forest hugged the walls around, climbed the castle, that was wan. “no one climbs up to the tower till the stars show themselves!”. Then live, Macduff. What need I fear of thee? Presentation Day, 30 April 2017. Some of the works have been presented this day. Some took shape during the presentation itself, as guided, inspired improvisations, till everyone entered the rooms of the tower, in pitch black that night, and got guided by their refined senses. Those documentation media and stories in a different butch. The day started early, with a wounded falcon escaping a cat, under the bridge of the train, close to the sea. We tried to help but also fear that our intervention could have been disruptive. Maybe another sign from the spirits of the place. The sea gate was guarded by Horus? Or by the cat? The Falcon lately disappeared without any trace. We went on eating some of the sheep that Eugenio the village butcher sacrificed in our honour. She cooked 7 hours in the wood oven behind his living room/shop. Another 7. But officially all started as we took care of a group of people from Scaletta, as they came with us on the old path from the sea to the tower, a path that some of them did not step upon since 30 years. The ascent was steady till the “Batteria” (Battery, both for cannons that to refuel our own), were the dancing stones from Nina Divitschek and Almud Krejza were waiting for us. Powerful poetry was repeated over and over, read from a strip of paper by Dierk Roosen in dutch language. And was translated by the Mother of RE, suddenly, with her german/sicilian incredible voice. Then, after our offer, some asked to be blindfolded. We had brought too few bandages but improvised some more. And so, lead by friends, or family, as they could see with other senses. The passage through the old empty houses towards the end of the path was enriched with names of forgotten people. The “Cascionara”, an old lady that used to sit close to the st. Paul memorial image. People that n not o one talked about since long. We arrived up, to the church. And up again to the castle. The images in the gallery refer to what has happened in the castle thereafter. These gallery images are taken by Irene Dominguez that was indefatigable during these days. They are (as all content here) cc Attribution-ShareAlike licenced. Dierk Roosen testing the interactive map and the projection for "Macalda"
the heads of the victims in the second room of the tower, bottom up. the chapel room the day of the presentation, 30 of april, traces of all interventions made in previous days... nothing is left to chance. Zoe Romano, looming the window, installation. memorabilia in plastic, Object trouve, take what you want. the entrance, Koba. Bend your head thou that enter here. Visiting we had happy people, and everyone is king, so the spirit of Frederic seems to suggest, the war between the church and the empire is over. Empty Ritual under the observance of the village priest. Irene reads her poem. Macalda plays chess? A metaphore of survival. the forest surrounds the tower, the shadows fight with the lights. 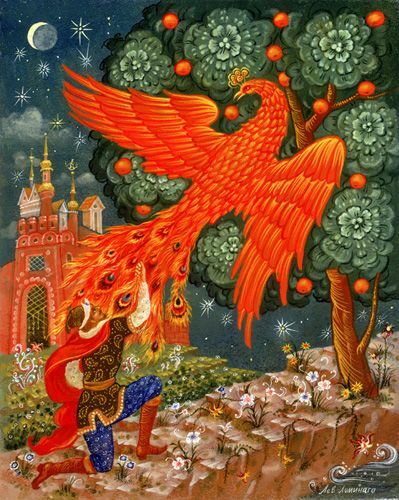 Irina Baldini dancing with the tree from Koba. Trasformatorio 2017 topic will be “situation based street art”. The program of the lab is designed to establish the ground work’s basics in Scaletta Alta and to lay lines of the surrounding, studying the site in relation to artist’s personal work and to begin transforming it through art interventions. Art interventions will be in the form of plans, of talks, rehearsals and any type of production related groundwork. Everything will be documented. As participants of the Lab Trasformatorio, artists will share their methods and tactics among each other. Some activities will be open to the public and the time of visit will be announced through billposting and the network. The works of Trasformatorio lab will be closed with a formal presentation of the results the 1st of may starting at 11:00 in the Rocca. All submissions were high in quality and was very hard to choose. We had participation requests from 15 countries. Some activities will be organised with the help of our partner organisations and friends. NB: Inhabitant of Scaletta are welcome to follow the works in various ways. Some of the lab activities will be open to public and all creative processes might involve them if they wish. 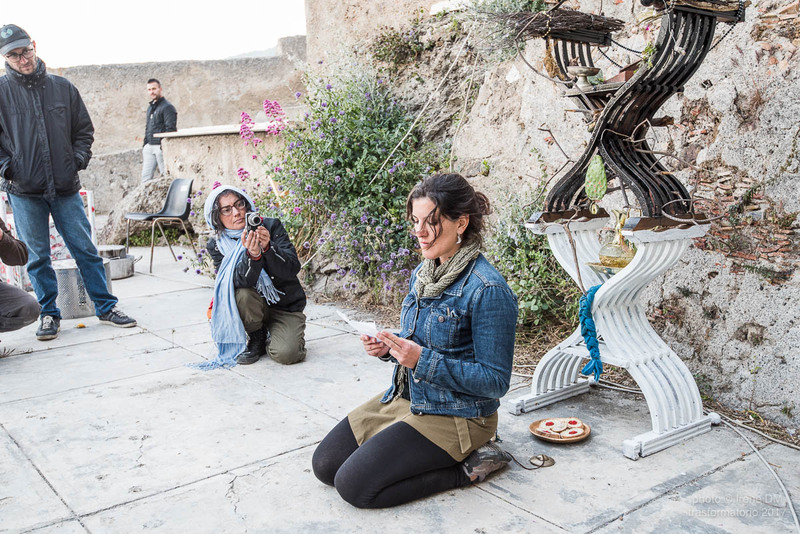 Together with the City of Scaletta Zanclea, in the person of the Assessora Daniela Di Ciuccio and the Cultural Association Siddarte from Milazzo, co-producing, we are proud to announce the third Trasformatorio in Sicily. 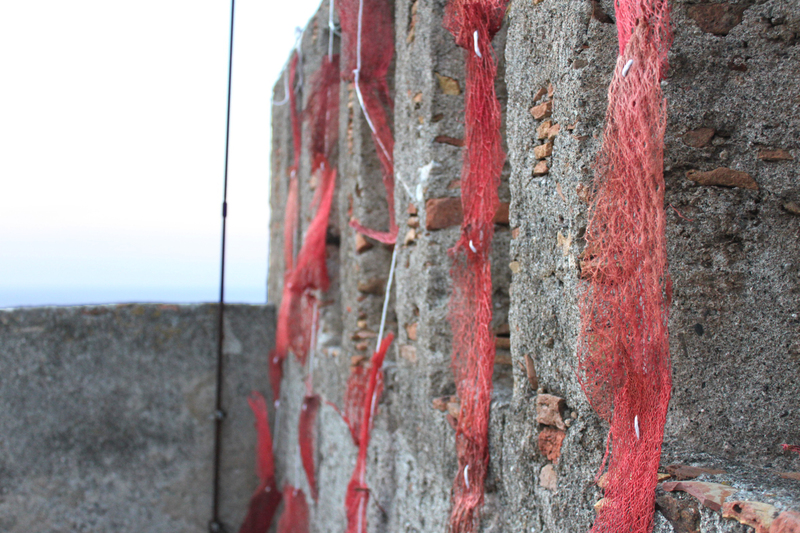 Trasformatorio is an international laboratory focusing on practices related to site-specific performance. It’s objective is to integrate the practice of the Hacklab with the research over performative arts and sustainability. To do so trasformatorio rely on a integrated approach experimenting with artistic methodologies in a co-design setting, crafted according to a everchanging situation. Since 2016 trasformatorio is part of the experimental research projects hosted by dyne.org, a international foundation and think (and do) tank based in Amsterdam. Trasformatorio intends to develop research, production and distribution of performances with innovative technical and artistic contents, envisioning new solutions to integrate sustainable technology in drama and through which viewers are confronted with themselves and the landscape. Shows and performances that can be prepared and delivered in any context, even off the theater and electricity grids. Shows and performances integrate a practice aimed to inclusivity, respecting the environment and human elements that interact with them. Trasformatorio is reserved to professionals, artists, actors, musicians, designers, architects, set designers, video/film makers, photographers, students of applied arts, theater studies and fine arts. 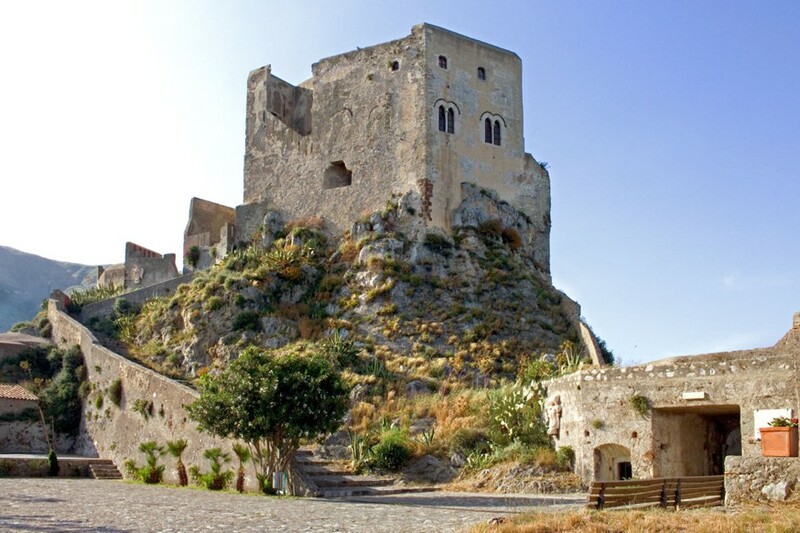 An equal number of spaces are reserved to Sicilian Artists. The laboratory is held within the territory that explores, in harmony with the human population, the natural ones and the architectonics that hosts him. 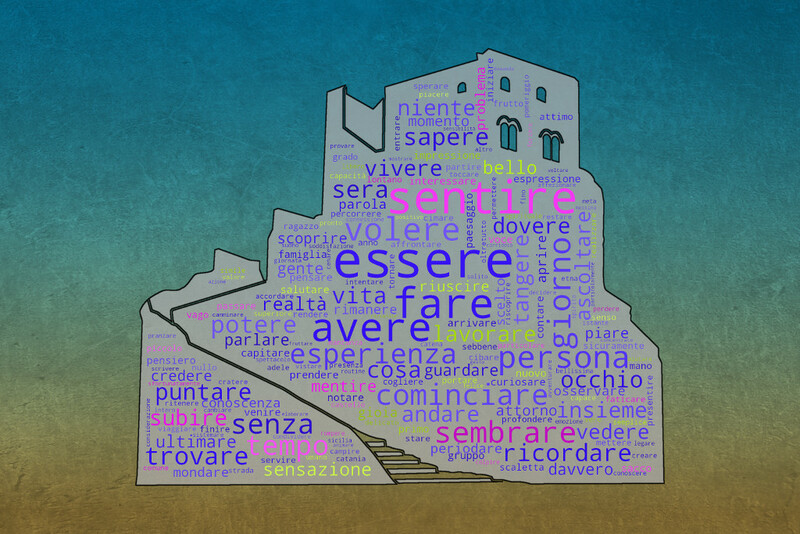 This edition will be held in Scaletta Zanclea, in conjunction with the local administration that houses us, using the “borgo” and the Castle tower “Rufo Ruffo”. Why is relevant? Because the languages and topics of performance, when connected at the same time with technological development and the essence human and natural landscape teaches us important lessons about the future we want. What is now and is going to be the equivalent of street art? What are the allowed uses of common space, what are the unwritten rules for social engagement and communication? Why in place of a new babylon we have got a fence? Are we all individuals also in the public sphere? What can a hacker learn in this situation from a street artist, and viceversa? As in T#0 we will devote our time and effort in gathering information and contact with our new location and represent it into our cathegories to see what kind of inspiration will take form from living in the ancient town of scaletta and in contact with the inhabitants and their natural and artificial environment. Designing, implementing and disseminating performances that are inclusive and sustainable, through the design of new entities, the revaluation of existing forms, the devising of situations and ways to live performance, in harmony with the natural and human environment that hosts it. So it will be. Scaletta Zanclea (38°02′41″N 15°27′46″E) is a small municipality in the Province of Messina in the Italian region Sicily about 15 kilometres (9 mi) southwest of Messina. Can be reached easily from Catania International airport with the train. The comune suffered heavily in the mudslides which devastated the area in 2009. The research performed by the Trasformatorio will be documented online and distributed on open licences. Trasformatorio favours open hardware and software development, freedom of thought and open circulation of ideas. Eventual collaboration works born in Trasformatorio are only required to keep this open access policy and quote trasformatorio in their communication. Application and development of personal skills on site-specific performance. Trasformatorio ethics is that participants share and co-develop their skills into new ones. So all participants are therefore considered co-producers of the trasformatorio. This is a research that has to be conducted within an ethic of exchange, responding to the specific environment (= people, history, space, nature) of Scaletta Zanclea. 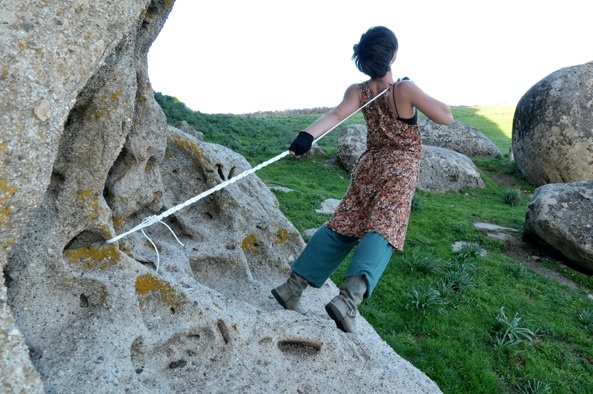 Technical research on sustainability; joint exploration of tools and techniques that can be used for site-specific media-rich performances and development of found material into performative one within experiemntal dramaturgical lines are the scope of the lab. We aim to help to create techniques to allow a theatrical transformation on site and we are a guest of the community to wich we want to give back. Research presentations, discussions, speeches, performances and installations can all be the means of dialogue: to create space for this is the scope of this first visit. The practitioners’ explorations were presented at the end different audiences, in multiple ways, according to the content, character and state of development of ideas and performance material, without any obligation for the participants and will be documented on the site and all possible ways. Fill in and send your application before 1st March 2017 at fredd@dyne.org. All activities and workshops on site will be free of charge for the selected participants. The city will offer free lodging and food, all the rest will be at your own expenses. 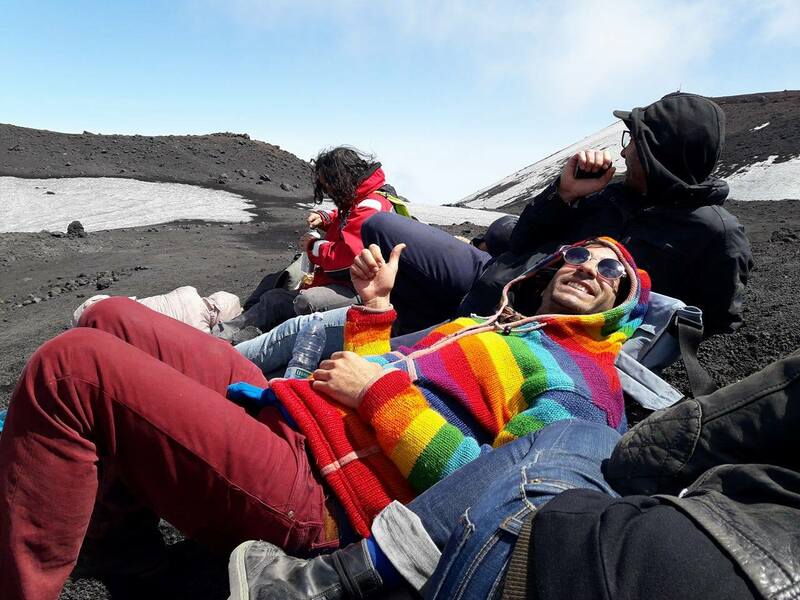 Trasformatorio will issue letters of invitation for the selected participants willing to apply for travel grants. The micro economy of the trasformatorio requires involvement, elasticity and patience. Is an experiment, a precious one in itself. Trasformatorio would never be possible without humans. To start with, thanks to Giuseppe Morgana, Emanuela Ravida’, Manuela Trovato, Gabriele Asbesto Molesto Zaverio, Mikko Lajola, Guido Gaudioso… Many more will follow. Un laboratorio artistico a cielo aperto: Trasformatorio sta arrivando! From 9 july to 14th, In Macao, Milan, we held a short ẗrasformatorio event to crash design a trnsformator in the form of a table game that we named ¨le grand Jeu¨. The game is about the future of our society.The name of the game refers to the tongue in cheek name given to diplomacy in the 19th century. The secret treaties and aggressive colonialistic policies that brought the world to WWI. The table of the ¨big games¨ that us are in no way able to touch. Playing the game within a group of people is, we found out, a great way to lay on the table progressive ideas about sustainability, a more robust economy, complementary currencies and renewable energy. Let players familiarise with them, try their own, and test te results in a common way. Moreover is fun.The Game design session has been lead by Federico Bonelli with the participation of Raffaella Ravida from Copenhagen Instituut for Interaction Design and Marco Sachy, expert in digital currencies (dyne.org) and Maddalena Fagnito, art director and activist from Macao. The game design own its shape to bravery of all players and fellow artists participating to the design sesisons and sharing points of view and ideas. Locally produced with bravery by the Macao team and Emanuele Braga. Artists and activists joined in to test the game every day, allowing us to prototype six different iteration of the table game design in only 3 days. I am also proud to mention the collaboration with wemake.cc, a spacious and gracious maker space in Milan, and the gracious permission from wood-skin.com to use one of their prototypes we saw hanging in wemake. This made possible the fantastic look of the game designed. For the first ever ¨le grand jeu” big match , held thursday in the big hall in Macao, 3 tables competed with standard rules getting to incredibly funny (end enlighting) results. We absolutely don need a grand jeu coming from above, the real one is made by the sum of our smaller one. Or, at least, this is the actual working hipothesis. Short: A table game allows to set a situation where concepts emerge from doing, players are by default considered as peers, become stakeholders of their local community. In the game were we can simulate different conditions and let behaviors emerge to get immediate feedback from the game environment. In a game all languages intermix, specialist terminology has to be translate, and stories emerge naturally. Stories are better than user journeys, they admit variations, link with personality traits and get nuances from situation to situation, they are to be told later, selected by memory and can be analyzed with calm, can lead to new ideas and designs. An interesting historical precedent to this approach is included in the genesis of the world famous counterpart of Le Grand Jeu, MONOPOLI. Monopoli, that has tought traditional forms of capitalism to children since the ´30es had been originally developed to demonstrate the feasibility of socialist and progressive doctrines of Tureau by a woman, Elisabeth Phillips that patented it in 1903. For those of you that did not yet know dyne she is a non-profit free software foundry, organised as a stichting in the Netherlands since 2005. With more than 10 years of expertise in developing tools and narratives for community empowerment Dyne has always included ART as part of the research methodology. We have partnered with dyne from the beginning of Trasformatorio, in 2012. Between the art related activities in her story dyne includes dynebolic, a distribution of linux for artists and activists, free-J, a libre VJ tool, the hosting for uncountable free software and art projects and being a true and recognised hub for open culture advocacy. and ENTROPICAL.org, that is a project connected with permaculture ideals, were abstract value of creation is used to juxtapose with new paradigms in distributed energy usage and value of re-cycling. forward for 2016 projects, were the re organisation of Trasformatorio will take place in the most factual way. Thank you all that have sticked with us, we will meet around, on mountain paths, caves, lost buildings, fruit gardens, small trails. Warm our harts around a fire and a mesh network antenna, to exchange stories of old and for the carving of the new ones.